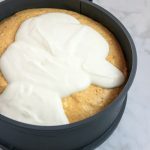 A Keto Instant Pot Pumpkin Cheesecake with Sour Cream Topping and an Almond Flour Crust for the holidays or any time you want to make a lovely low carb cheesecake in your Instant Pot! 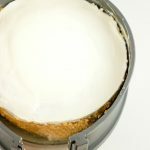 The Instant Pot does an absolutely beautiful job at cooking a cheesecake to perfection. 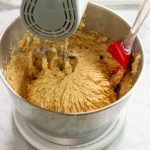 The water, steam, and pressure used in the Instant Pot cooking method are similar to the “Bain Marie” bath used in the oven to make cheesecakes, but the Instant Pot does a way better and even more effective job. 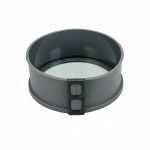 My favorite Non -Stick Springform Pan that fits in the Instant Pot. 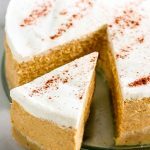 An almond flour crust, a creamy pumpkin cheesecake filling and a sweet vanilla sour cream layer on top. 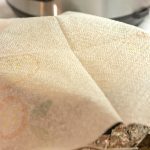 Cut out a round shape of parchment paper slightly larger than the 6 x 3″ or 7 x 3″ inch springform pan (that fits in the Instant Pot). Place the parchment paper at the bottom of the pan. The paper should fold up slightly beyond the bottom of the pan. Spray the entire inside of the springform pan and liner with non-stick coconut oil spray. Set aside. In a medium bowl combine all the crust ingredients and stir until crumbly. Press the crust mixture into the bottom of the pan with your hands to cover the pan. Set aside. 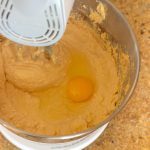 Using a stand mixer or electric hand mixer on medium-high speed blend: cream cheese, canned pumpkin, 1 cup Swerve sweetener, heavy cream, pumpkin pie spice, cinnamon, and 1 tsp vanilla extract. Blend thoroughly, while scraping the sides of the bowl until completely combined and creamy. Add the eggs, one at a time, gently mixing on low until just combined without over beating. Cover the outer bottom of the pan with a sheet of tin foil to keep water from seeping into the cheesecake. Pour the pumpkin cheesecake filling into the pan over the crust. Place a paper towel over the top of the pan and wrap a sheet of aluminum foil over the top of the paper towel to hold the foil in place. Set aside. Pour 1½ cups water into the inner pot of the Instant Pot. Fold a 24-inch long piece of aluminum foil lengthwise into thirds to create a sling for easier removal of the pan. Place the cheesecake pan on the center of the foil sling and place the pan and sling on top of the instant Pot rack with the handles up. Grasp the rack handles to gently lower the pan into the Instant Pot. Leave the sling in the pot. 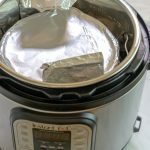 Close and lock the lid on the Instant Pot. Turn the pressure valve handle to Sealing. Select Pressure Cooker (Manual) on High Pressure. Set the timer for 58 minutes. 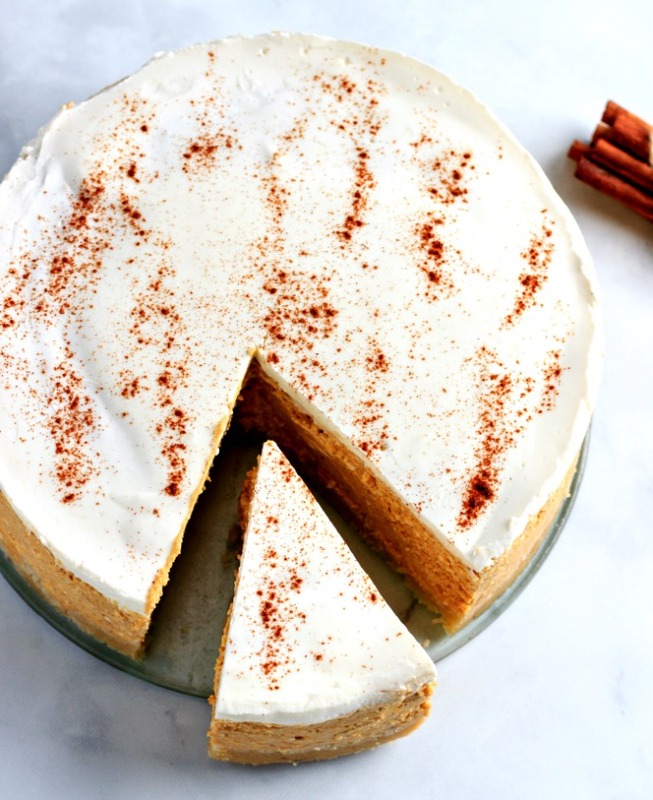 While cheesecake is cooking, in a medium-size bowl whisk all the sour cream layer ingredients until blended, cover and refrigerate. Once cooking time is complete, use the Natural Release method for 25 minutes and then quick release any remaining pressure. 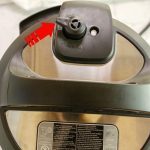 Remove the lid and carefully grasping the sling handles, lift the cheesecake out of the Instant Pot. Remove the foil and paper towel from the top of the pan. If water has accumulated on top of the cheesecake, gently blot it with a paper towel. Let cheesecake cool on the counter for an hour. While cheesecake is still warm (It’s okay if the center looks less firm and jiggly), spread the sour cream mixture topping over it. Cover the cheesecake pan with aluminum foil and refrigerate for 12 hours or more until firm. Carefully and gently release the outer spring ring of the springform pan. 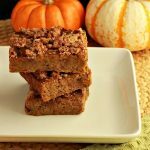 Slice into ten slices, sprinkle with ground cinnamon to garnish and serve. 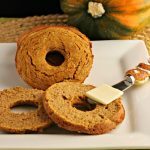 Nutritional Data: Yield: 10 slices, Serving Size: 1 slice out of 10, Amounts Per Serving- Cal: 325, Carbs: 7g, Net Carbs: 5g, Fiber: 2g, Fat: 28g, Saturated Fat: 15g, Protein: 8 g, Sugars: 3g. 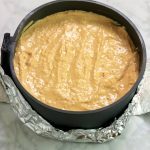 A tasty, creamy Keto Instant Pot Pumpkin Cheesecake with Sour Cream Topping is low carb, gluten free and made in the Instant Pot. Cut out a round shape of parchment paper slightly larger than the 6 x 3" or 7 x 3" inch springform pan (that fits in the Instant Pot). Place the parchment paper at the bottom of the pan. The paper should fold up slightly beyond the bottom of the pan. Spray the entire inside of the springform pan and liner with non-stick coconut oil spray. Set aside. 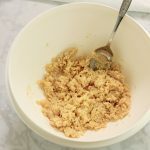 In a medium mixing bowl, combine all the crust ingredients and mix until crumbly. Press the crust mixture into the bottom of the pan with your hands to cover. Set aside. Add the eggs, one at a time, gently mixing on low until combined without over beating. Cover the outer bottom of the pan with a sheet of tin foil to keep water from seeping into the cheesecake. Fold a 24-inch long piece of aluminum foil lengthwise into thirds to create a sling for easier removal of the pan. Pour the pumpkin cheesecake filling into the pan over the crust. Place a paper towel over the top of the pan and wrap a sheet of aluminum foil over the top of the paper towel to hold the foil in place. Set aside. Pour 1½ cups water into the inner pot of the Instant Pot. 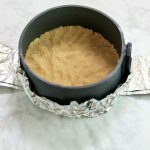 Place the cheesecake pan on the center of the foil sling and place the pan and sling on top of the instant Pot rack with the handles up. Grasp the rack handles to gently lower the pan into the Instant Pot. Leave the sling in the pot. If I were to put it in freezer after it’s done, would it be able to be eaten in a lot less time then 12hrs? I don’t know if we can wait that long!! Possibly, but I haven’t tried it. It does need some time too set, but maybe it would set faster in the freezer. I used an 8 or 9 inch pan in my 12qt cooker. I did “manual” 28 minutes. Perfect! Next time I will double the whole recipe and do the whole 58 minutes. Definitely bringing this to Thanksgiving dinner! Wow, I have not tried a 12 quart cooker yet! That is fast! Couple questions Stacey. I have an 8qt IP and 8 in spring form (2′ high) If I make it as given, will the crust be too thin and the cake also? How much should I increase the recipe if that is the case. Will be spread out about 2 more inches. Also, do you use granulated or powdered swerve I use monk fruit granulated and it seems to stay so grainy. Maybe I should melt it with the butter? thanks. 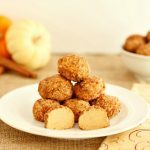 this is going to be my Thanksgiving pumpkin dessert and I am going to make a trial run. Lucky me! Hi Lonna, You may want to almost double the crust recipe for a thick crust in an 8 inch pan. I have used both granulated and powdered swerve in the recipe. 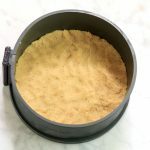 If the sweetener you use gets grainy you could use powdered (grind into a powder form with food processor) or melt it in the butter may also work. You may also need to use a shorter cook time as the cheesecake will not be as thick. Hi Stacey! Are there different models of the IP? I know there is one called ‘Instant Pot DUO60 6qt multi-use programmable pressure cooker, etc’ I read a review somewhere that it dropped to $50 last year at Walmart, and Aldi’s had it for $39. So, if this is the one that you use, I’ll start checking prices. This cheesecake looks amazing, and I also want to try your Clover Rolls! Hi Sandi, There are different sizes and models. I have the 6-quart Instant pot Duo as you mentioned. Yes, shop around and I bet Black Friday will have a great sale! How are you Sandi? Are you still making jewelry and other crafts? Not doing much with crafts/jewelry since Frank had a stroke in March of 2017. He is in a long term care facility, with the hopes of him getting some kind of mobility back and be able to come home, or go to his nephew’s house which is a lot bigger than ours. I’m trying to stay positive and hopeful, but it has been a year and a half already. Anyway, a lot of things have been put on hold, but I still have time to cook and try some keto/low carb recipes! I’m so sorry to hear about Frank. I’m praying and hoping he gets better and more mobility. Stay strong, Sandi. Liz, That size won’t fit in my 6 quart IP. Do you have a bigger IP? Hi, I do. The biggest one? I forget the size. 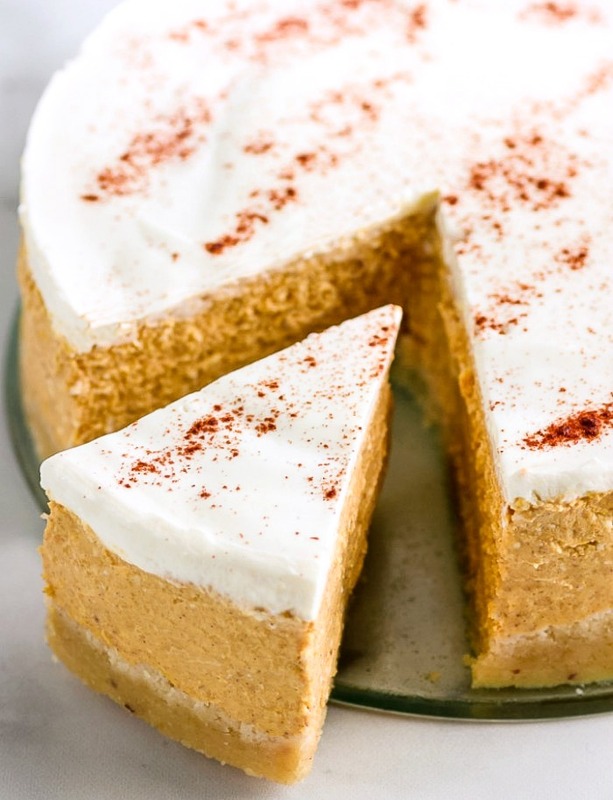 Since I’ve gotten it I’ve only used it once and I can’t wait to make this pumpkin cheesecake!! Liz, I would use the maybe a little shorter cook time as the ingredients amounts are the same but the cake is not as thick. If you take it out and the center is still very liquid (soft and jiggly is okay), then you can put it back in and cook another 5 minutes. Sorry, 1/3 of WHAT measurement for the butter? This looks great! OMG! 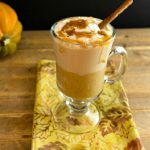 That looks so amazing – moist creamy and delicious! YUM! Oh my… I am DROOLING! 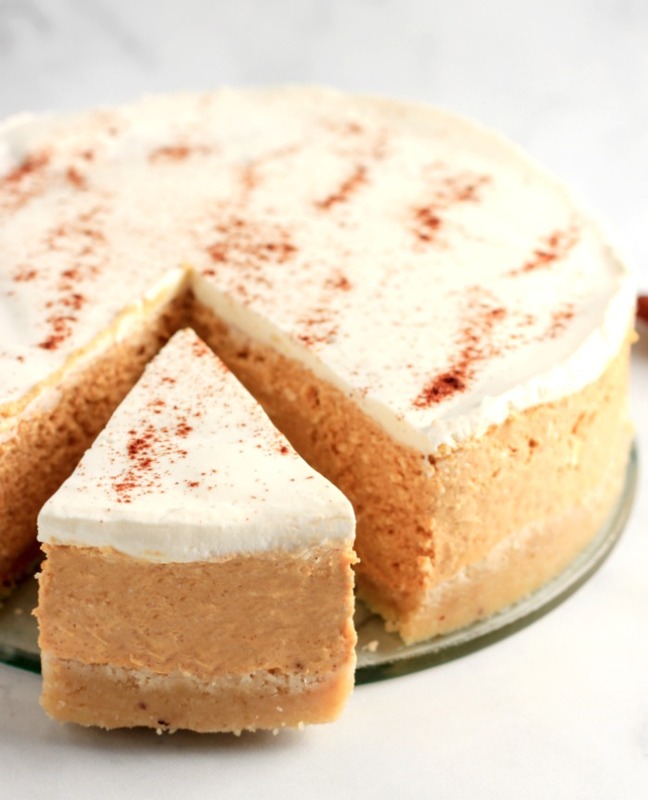 Pumpkin cheesecake is so tasty! I’d like to cut the recipe in half and use a 4” springform pan. Should I still set the IP to 58 minutes? I would try probably less time for a 4-inch version that cuts the ingredients in half. Possibly 35 to 40 minutes. I would try it at 35 and if it is not at all done, put it back in for another 10 minutes. Oh yum!! Pumpkin everything is SO me, and even better that it is in the IP!! I love the sour cream topping too! This is the most gorgeous cake, and I love that you can make it in the IP! I think my family will love this over Thanksgiving. Stacie! This is the perfect festive treat! I can’t wait to try it! Ok, so this might actually be the recipe that makes me get the equipment for my IP to make a cheesecake! This looks so amazing! Thank you, Renee. You definitely should make a cheesecake in the IP, as I think it makes the best cheesecakes, puddings, and custard types of desserts!